UNB scientist Audrey Limoges is digging up microscopic pieces of our distant past to help understand the future of Canada’s fishing, health and tourism industries in the face of ongoing climate change. She’s studying the ancient remains of algal organisms buried deep in the sediment of the ocean floor. These organisms, such as phytoplankton, live in the upper layers of the ocean and sink down to the seabed after they die. They are the base of the ocean’s food chain and play a crucial role in the health of the entire marine ecosystem. The remains, or microfossils, act as a window into the past. They contain information about changes in species composition and abundance. They also show how these organisms respond to changes in marine conditions like temperature or salinity. As you delve deeper into the seafloor sediment, the window allows you to see changes stretching back to several centuries or even millennia. Dr. Limoges, an assistant professor in earth sciences at UNB, has been awarded $150,000 for the project through the Canada Foundation for Innovation’s John R. Evans Leaders Fund. The John R. Evans Leaders Fund helps a select number of exceptional researchers at institutions across the country conduct leading-edge research by giving them the tools and equipment they need to be or become leaders in their field. The New Brunswick Innovation Foundation matched these funds, also awarding $150,000 to the project. Another $65,000 was contributed by UNB. “This is a significant investment that will build on the leading-edge research in environmental science happening at UNB today,” says David MaGee, UNB’s vice-president of research. Dr. Limoges will establish lab facilities to study the microfossils of algal organisms to assess the impact of ongoing climate change on the marine coastal regions of eastern Canada, from the Maritime provinces to Baffin Island. The facilities will also allow researchers to assess trends in the development of harmful algal blooms, with the aim of creating tools to better anticipate and remediate them. The Past Primary production and Environmental Reconstructions (PAPER) laboratory will be the only lab of its kind in Atlantic Canada and will open the door to a wide variety of research projects focused on paleo oceanographic and climatic studies. “The research activities that will be made possible by these facilities will be highly relevant for the fishing, health and tourism industries, which are very important for the cultural identity and economy of Canadians and Atlantic Canadians in particular,” Dr. Limoges says. 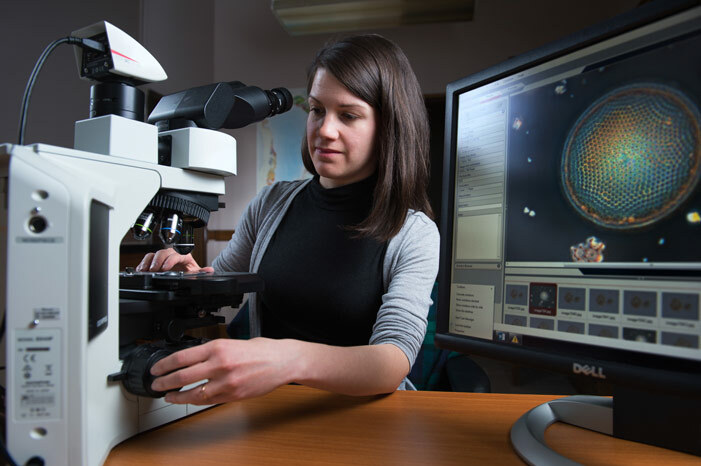 Photo: Dr. Audrey Limoges, an assistant professor in earth sciences at UNB, is setting up a microfossil lab to assess the impact of climate change on marine ecosystems. It will be the first and only lab of its kind in Atlantic Canada. Credit: Rob Blanchard / Photo UNB.